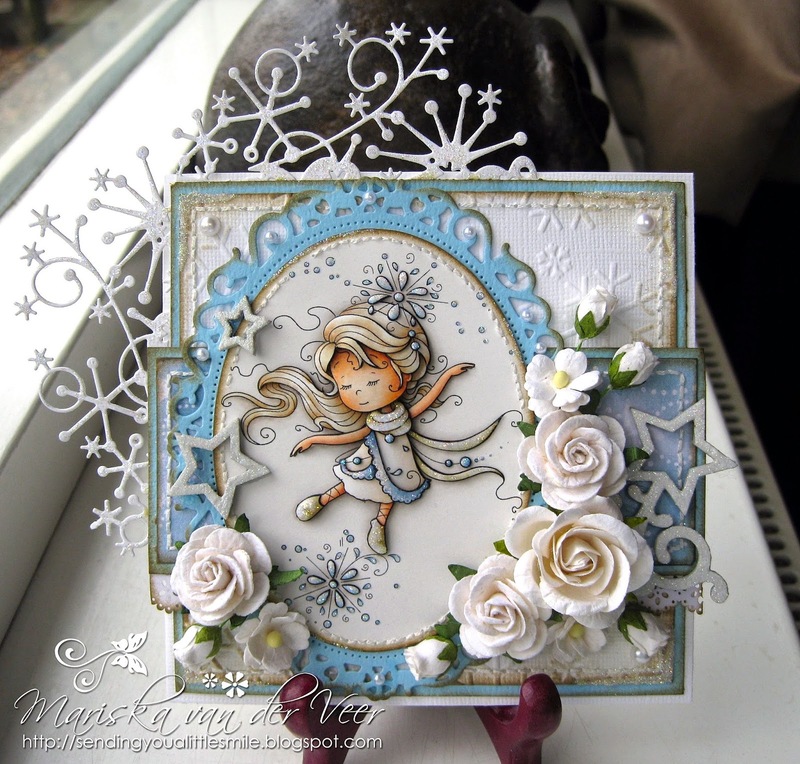 Today I'd like to show you a card I made with the newly released Snowflake Dancer by Wee Stamps. 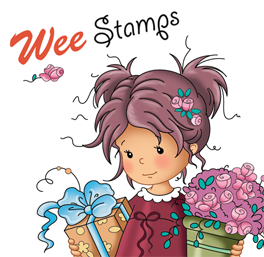 This stamp is available as a digital image directly through Wee Stamps and as a rubber stamp through Whimsy Stamps. I adored the Snowflake Dancer from the second Sylvia showed her to me. I think she's delicate and elegant and I knew right away that I wanted to create a cool card around her. The white cardstock was simply embossed with a Cuttlebug Ice Crystals embossing folder, the strip of blue paper is an old scrap I had from Magnolia and I thought those two would be a lovely setting. I kept the embellishments all white though I did play around with blue flowers but that, for me, took away from the pureness of this card which is what I wanted. A close up of the fairy, as always colored with Copic Markers, I tried to go for a bit of a distressed look, not to much color. The pretty chipboard star-shapes that I have used are from SisterArt Creation, they don't have a webshop but sell through Facebook. Just click on their photos and if you want to purchase something add a comment below the picture with the chipboard you want. Their chipboards are of a very high quality and I love the shapes. I painted these chipboards with white paint, dusted them with stardust glitter when the paint was still wet and gave them a coat of varnish after they were dry. They sparkle like crazy and I adore them. 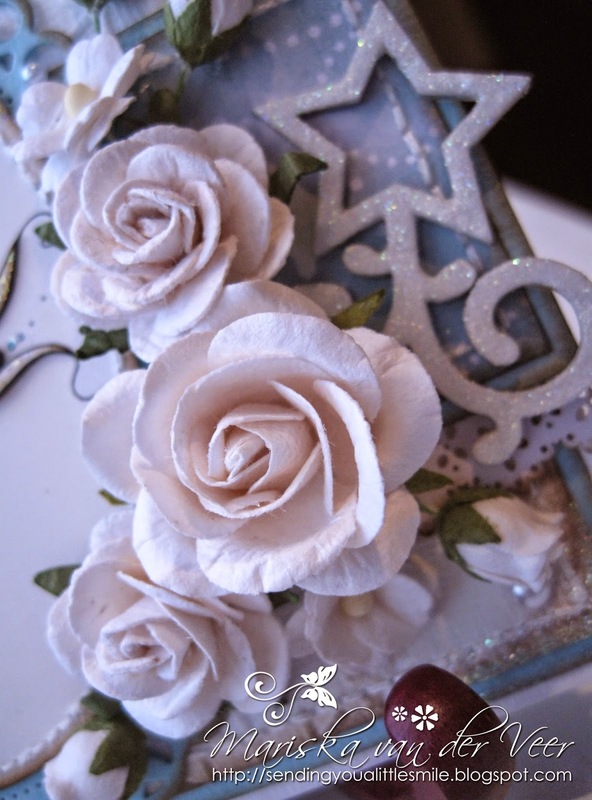 Gorgeous white Wild Orchid Crafts flowers, you'll find the links to the different flowers below. 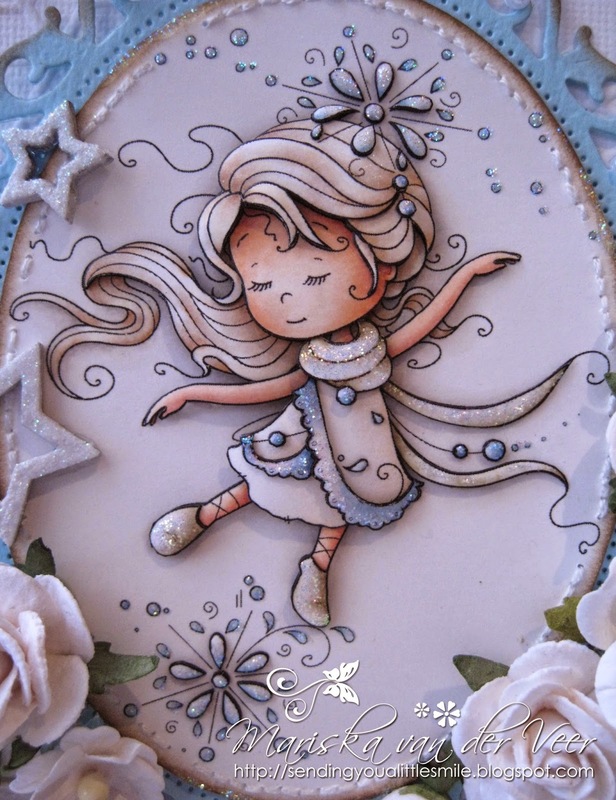 And again a chipboard shape from SisterArt Creation. 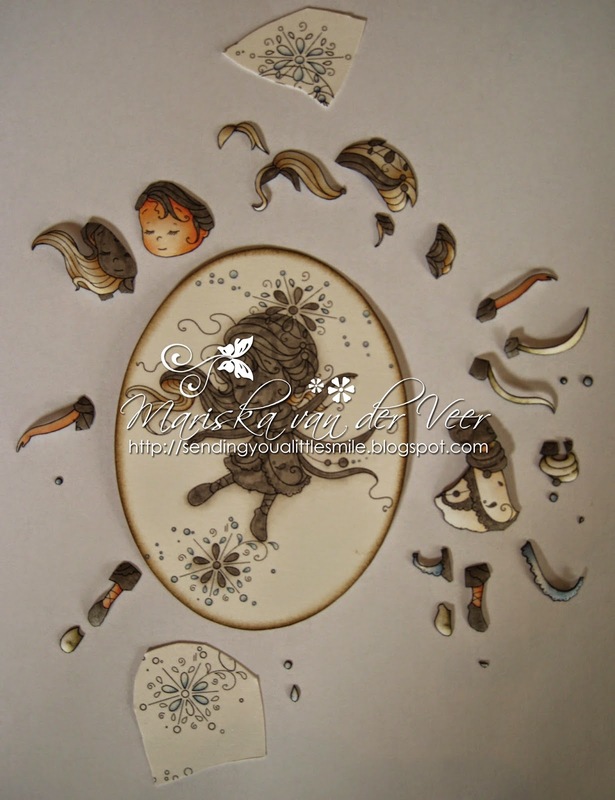 And the little pieces the image was made with. I cut out most of the snowflake parts one by one after the rest of the image was done, that's why you see them uncut in this picture. Well that's it for me today. Hope you like my card but you have just gotto love the Snowflake Dancer right? And as mentioned in the header of this post.... I get to give one of these cuties away as a digital image to one person leaving a comment on this post! If you have already purchased the Snowflake Dancer you of course get to pick a different image of your liking. I'll pick a winner somewhere tomorrow so you have all day today and a bit of tomorrow to leave a comment! Other: Floral Oval Die set and oval dies by Spellbinders. Chipboard shapes by SisterArt Creations. Stitches by hand. Dutch Doobadoo A5 Borders. Memory Box Frostyville Border. Cuttlebug Ice Crystals embossing folder. Star Dust and Diamond Stickles. White paint, Glamour Dust Crystal glitter and varnish. Awwwww such a sweet image, stunning colouring and full of beautiful detailing. All the sparkle adds to the magical feel. As I told you on fb, I can't say anything but adorable, the sweet 3d image, the perfect details and all the lay out, everything's super. Love your card, so beautiful! 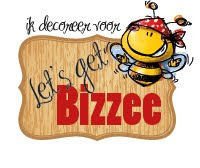 wauw wat is het toch een geweldige kaart Mariska, ik ben en blijf fan van je, je maakt echt zulke mooie kaarten. De stempels van Wee stamps zijn ook zo geweldig mooi. Je hebt zoveel mooie details. Blijf me steeds verwonderen hoe je dat och doet met die 3d. Echt geweldig, ik kijk al uit naar je volgende kaart of project. wow, I'm without words....your projects are fantastic and I love your paper piecing technique!! I really love your work.It must take long time to do this?It,s always a pleasure to see what you are doing.Have a nice creative day. So beautiful as always Mariska. Such a cute and beautiful card here Mariska, really beautiful. And as always you´ve just made her look even better with your amazing coloring and paper piecing the image. It looks just fabulous hun. This is beautiful Mariska. 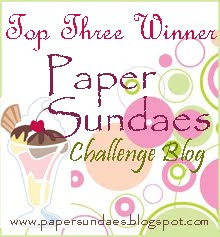 I love the cute image and such a beautifully designed and embellished card. Thanks for sharing this wonderful creation! nice! Woow stunning card!! This is such a gorgeous creation with so many beautiful details! Mariska, what a wonderful work from you. 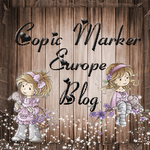 I love the stamp of Sylvia and would be very happy about the sweet little lady as Digistamp. I try my luck and look like back here. This card is beautiful! I love the simplicity of the color palette - it just emphasizes the delicate simplicity of the image. Wonderful! Mariska, as I mentioned on Facebook on the Wee Stamps page, I'm so in love with this that I needed to come leave you love as soon as I could today. There's a reason this is my very favorite image and I hope I can create a card that does it (and my heart's vision) justice. When I especially love a Wee stamp, I'm always excited to see how you use it because your work is something to treasure! When I saw this this morning, my heart did the sparkliest pirouette ever.. you've achieved the beauty this dancer emanates and it is one of my very favorite cards you've ever made. I apologize for the novel, but this just strikes such a chord with me and I wanted you to know how much I adore it. :o) The sparkling stars/snowflakes and pure white flowers are brilliant. Lovely work once again, Mariska. And thank you for continually inspiring us! Huhu Mariska, such a sweet image. And I like your coloring and your inspirations. Mariska.....this is beautiful! I love the detail. I have come back several times just to look at it and get chills each time. A beautiful piece of art! Gorgeous and adorable Christmas card, amazing layering. Such a magical creation! The image is gorgeous and I love your frosty colour scheme. Wat is het weer een schattige stempel, mijn verzameling zal alleen maar groeien. Je hebt er een prachtige kaart meegemaakt in mooie zachte kleurtjes. Loove your card, it's georgeous! Live, laugh, love... dream big!